Died February 7, 2019, much-loved mother of Eileen and Ann, mother-in-law of Don and devoted grandmother of Kyle and Piers. Funeral Service will be held from her home, 10 Albany Square on Tuesday 12th at 2.00 p.m. and afterwards to Roselawn Crematorium for 3.30 p.m.
Family flowers only please. Donations in lieu, if desired, to NI Chest, Heart & Stroke c/o Stephen McCosh Funeral Directors, 117 Shankill Road, Belfast, BT13 1FD. Deepest sympathy to Eileen, Ann and family circle from Uncle David and family. Deeply regretted by her sister Lily and family at home and abroad. Family flowers only please. 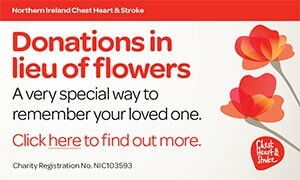 Donations in lieu if desired to NI Chest Heart & Stroke c/o Stephen McCosh Funeral Directors, 117 Shankill Road, Belfast, BT13 1FD. I am sorry to tell you that Isobel YOUNG has passed away.